For hundreds, for thousands of years, perhaps, people have been reading, one way or another. I have some art showing Chinese reading scrolls, as Romans and Greeks must have. So what would the new reading paintings depict? Woman with pc? Man with Kindle? I'm sure we will see those paintings with pc and and Kindle - and thingamabobs we haven't even heard about yet - but I doubt that real books will get out of fashion. 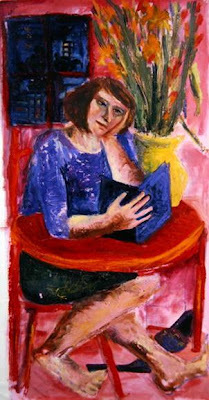 And painters will keep painting people reading books as they are more interesting than all the new stuff!